I am sure you experience after export from some software. The number treated as String. And you can’t use it for doing calculation. Copy the data to new sheet or new workbook. Next, you just copy and paste the formula accordingly. 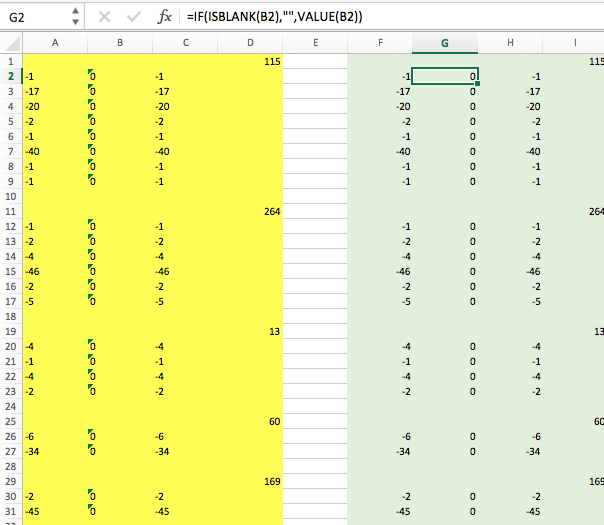 Final step, you select all the formular area, then paste it as VALUE. Below example, as you can see the yellow part is original data, it mixed with string and number. The little green arrow on the top left corner indicate you can convert it to other format, but you have to do it one by one. On the green part is followed by formular converted it to number.